Last year, Hawkers welcomed Larry Sidor to their Reservoir home. The former Deschutes brewmaster who now heads up the much admired Crux Fermentation was calling in on an old acquaintance, Hawkers CEO Mazen Hajjar, and, while in town, they laid down a wheat wine, a high alcohol brew featuring a high proportion of wheat. The majority was then put into Aquavit barrels (Aquavit being the Scandinavian spirit flavoured with various herbs and spices) and left. And left. And left. The contents were finally deemed ready for release for winter 2018 and, as with past imperial stouts from Hawkers, turned into a number of variants: straight barrel aged then two versions featuring peach and blood orange respectively, all weighing in around the 13 percent ABV mark. The Barrel Aged version is, logically, the truest representation of the barrels and was the pick at Crafty Towers. The combination of the rich base beer and Aquavit delivers spiced fruits and marzipan aromas reminiscent of a Rumtopf or booze-soaked Christmas cake, even a traditional Schnapps. For all that, it comes across as rather elegant and refined, with waves of toffee rising as it warms. As for the Peach variant, it's hazier and fatter in body, with the spices somewhat muffled by the fruit addition. The peach makes itself heard, while also making the beer perceptibly stronger, even though it's slightly lower in alcohol, and sweeter in a treacly sense. The Blood Orange variant is the one that seems to have moved furthest from the original, with the fruit providing the dominant character. 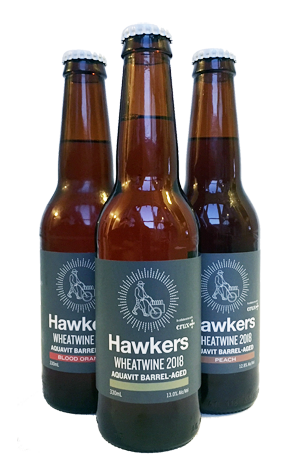 You'll still pick up some spiciness and a boozy prickle, together giving the impression of a liqueur as much as anything in what's an intriguing opening salvo from Hawkers' winter of barrel aged releases worth tackling as a trio.